Following the 2013 status elevation of Pinnacles National Monument there are now nine national parks in California, more than any other state; second is Alaska, which has eight. Additionally, the National Park Service (NPS) manages seven national monuments (Cabrillo, Castle Mountains, César E Chávez, Devils Postpile, Lava Beds, Muir Woods, Pinnacles), two national recreation areas (Golden Gate, Santa Monica Mountains), and a few national historic parks. Various other national preserves are administered by the Bureau of Land Management (BLM) and United States Forest Service (USFS). 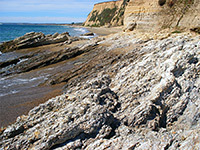 Other California listings: state parks and state natural reserves. Established July 2015, this monument covers a hundred mile section of the Coastal Mountains in north California, from the vicinity of Lake Berryessa, northwards to the upper reaches of the Eel River. 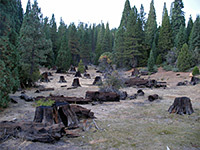 Much was part of Mendocino National Forest; other areas were state lands, or managed by the BLM. This rather remote region, most of which is thickly forested and difficult to access, is home to many plant and animal species. 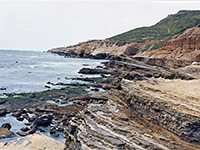 Panoramic views over San Diego Bay, whale watching, an historic lighthouse and tidepools along the coast are the attractions of Cabrillo National Monument, which covers a small area near the southern end of Point Loma, a narrow spur of land jutting out into the Pacific Ocean on the west side of San Diego. The monument is little known compared to the large national parks of California but its city location ensures a steady stream of visitors all year. This large but little known national monument contains the entire California coastline between Mexico and Oregon, beginning at the waters edge and extending seawards for 12 miles - approximately to the end of the continental shelf. Most is the Pacific Ocean, but the preserve also includes countless reefs, islands, sandbanks and rocks that harbor birds and other wildlife such as sea otters, seals and sea lions. The Carrizo Plain is a southerly extension of the San Juan Valley, about 20 miles southwest of Bakersfield, and it represents the largest undeveloped section of the San Joaquin region of south California - varied terrain with many different habitats which supports a great diversity of wildlife species. Part is protected in a new national monument, one that has few visitor facilities. The Castle Mountains are a small north-south range in the Mojave Desert of east California, enclosed on three sides by the Mojave National Preserve. 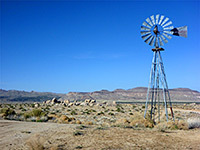 Landscapes include grasslands, Joshua tree forests and granite outcrops, while many old mine relics are scattered over the peaks and valleys, centered on the abandoned townsite of Hart. The life and achievements of activist and labor leader César Estrada Chávez (1927-1993) are commemorated in a new national monument (created in 2012), which contains several sites along seven miles of Hwy 58 between Bakersfield and Mojave, in the southernmost foothills of the Sierra Nevada. Five beautiful, uninhabited islands 25 miles off the south California coast are the main attraction of Channel Islands National Park, reachable only by boat or light aeroplane, and hence very little visited compared to other parks in the state. Besides the excellent scenery, the islands are home to many species of animals, some found nowhere else. Despite its ominous name, foreboding reputation and extreme climate, visitors to Death Valley will find a place of amazing beauty with many colorful cliffs and canyons, miles of pristine sand dunes, unique evaporative salt features, historical relics and even a diverse range of wildlife. The national park covers 3 million acres making it the largest in the contiguous USA, and contains the lowest point in the Western hemisphere (Badwater, 282 feet below sea level), but also extensive mountainous terrain with elevations up to 11,000 feet. 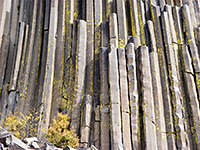 Considered one of the top geological sites in California, Devils Postpile is an outcrop of volcanic basalt composed of parallel, multi-sided columns, a relic of long ago eruptions from a nearby volcano. The formation is part of a small national monument near Mammoth Lakes in the eastern Sierra Nevada, also containing a scenic section of the North Fork of the San Joaquin River. Because of heavy winter snowfall, the site is only accessible about half the year. The eminent playwright Eugene O'Neill wrote many of his most famous works at an elegant countryside mansion (Tao House) near Danville in the San Ramon Valley east of San Francisco; the residence became a national historical site in 1976 and may be visited by advance reservation only. This small national monument (established in 2012) protects a historic US army fort, in operation between 1917 and 1994, located just inland from Monterey Bay. The site includes several square miles of hilly, sparsely wooded land, crossed by various trails. A number of rare plants and animals are found in the meadows and valleys. Fort Point was constructed between 1853 and 1861 on the south side of the Golden Gate (the entrance to San Francisco Bay), to repel sea-borne attacks during the American Civil War. Sporadic military occupation continued for nearly 100 years, followed by a period of disuse before the site came under NPS protection in 1970. Although giant sequoia are visible most spectacularly in Sequoia National Park, there are 38 other groves of the huge trees found along a 70 mile stretch of the western slopes of the southern Sierra Nevada, the majority rather inaccessible. These are part of a USFS-managed national monument, which has two sections 25 miles apart, accessed by state highways 198 and 190. 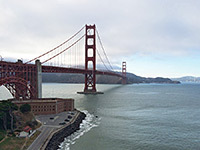 Golden Gate NRA comprises a varied collection of cultural, historical and geographical features including 59 miles of the Pacific coastline either side of San Francisco - a relatively developed, city-based park that attracts up to 17 million annual visitors. 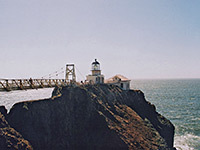 Protected sites include beaches, coastal bluffs, forts and other military installations, historic buildings, Alcatraz Island, the Presidio, San Francisco National Cemetery and the Marin Peninsula. The mansion where naturalist and conservationist John Muir lived for the last 24 years of his life (1890-1914) is protected as a national historical site, open to the public Wednesday through Sunday. The house is located in the hills south of Martinez, 30 miles northeast of San Francisco. There is no spectacular central attraction at Joshua Tree National Park, just many square miles of beautiful, wild, unspoilt desert scenery. 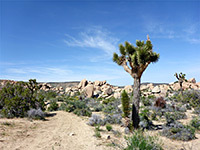 Three factors make the park special; the eerie, spiky Joshua trees which grow densely in the western half, six oases where California fan palms grow in their natural surroundings, and the extensive outcrops of huge granite boulders, up to 100 feet high, which line the mountain ranges scattered over the whole area. 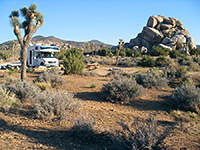 The park has excellent trails and scenic campgrounds. 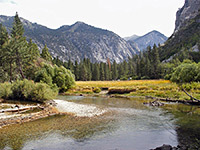 Kings Canyon NP contains a huge, unspoilt section of the central Sierra Nevada mountains, including several deep glaciated canyons, countless lakes, pools, meadows and waterfalls, and over 20 peaks that exceed 13,000 feet. 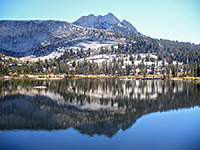 Most of the park's 462,000 acres are accessible only to backpackers; the two popular locations, reached by a main road, are Grant Grove (forests of giant sequoia trees) and Kings Canyon, a steep-sided valley. Originally a side-vent of a much larger and more ancient volcano, Lassen Peak has erupted several times in the last few millennia, most recently after a violent explosion in 1915. 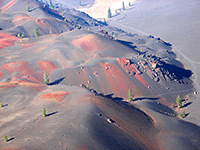 Contemporary volcanic activity continued until 1922, by which time the mountain and surrounding area had become part of the Lassen Volcanic National Park; besides the peak, this fascinating region also contains many geothermal features including mud pools, hot springs and gas vents. 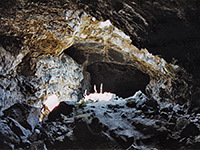 Lava Beds National Monument has large areas of jumbled lava flows, last deposited as recently as 2,000 years ago, mixed with a variety of other volcanic features including cinder buttes, spatter cones, chimneys, craters and especially lava tube caves, of which over 400 have been discovered so far. The monument sits in an empty and relatively unknown region of wooded hills and grassy prairie in far north California, east of the Cascade range. Manzanar was one of ten camps used to detain Japanese citizens during World War II - over 100,000 people were held here, for up to 3 years. The site has an isolated location alongside US 395 in Owens Valley, 50 miles south of Bishop. 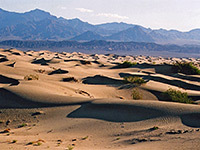 The Mojave Desert extends across several hundred miles of southeast California - mostly sagebrush flats, sand dunes and inhospitable mountains, but also ghost towns, volcanic craters and lava, historic sites and buildings, various other unusual geological features and a surprisingly wide range of wildlife. The most unspoilt and unpopulated region is the East Mojave, and a large expanse between I-40 and I-15 containing much scenic and unusual terrain is protected as a national preserve. 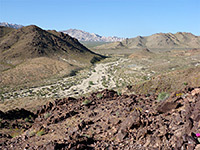 A large area of mostly undeveloped desert between Joshua Tree National Park and Mojave National Preserve received extra protection in 2016 following the creation of Mojave Trails National Monument - extending from the vicinity of Needles near the Arizona stateline, westwards to the Cady Mountains near Barstow. The preserve includes the most scenic section of old Route 66, together with various other historic trails, following wide valleys bordered by mountains, sand dunes and lava flows. Named after the famous Scottish naturalist John Muir, who visited here several times from 1903 onwards, Muir Woods form a small part of the forested slopes of Mt Tamalpais, near the southern end of the Marin Peninsula. The national monument contains several groves of giant redwood trees either side of a small stream, and is very popular (receiving nearly one million visitors each year) on account of its proximity to San Francisco, just 15 miles south across the Golden Gate Bridge. 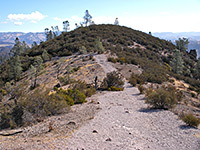 In a hilly, sparsely settled area of west central California, Pinnacles National Monument (now a national park) was established in 1908 to protect the remains of an ancient volcano, created 23 million years ago by an eruption associated with the San Andreas Fault, which today runs along a straight valley a few miles east. The monument is centered on a range of rugged, chaparral-covered mountains topped by unusual eroded formations including spires, cliffs, smooth boulders, jagged ridges, and several talus caves, formed from narrow ravines partially filled by fallen rock. Point Reyes is a large, triangular peninsula, bordered on the ocean side by long, wind-swept beaches beneath high cliffs or extensive sand dunes, and inland by a straight valley (Tomales Bay), directly above the San Andreas Fault. Around 150 miles of trails cross-cross the rolling hills and meadows of the peninsula though the main attraction is the 60 mile shoreline, which is easily accessible by car in several places and all is explorable on foot. Port Chicago (near Concord on Suisun Bay) was the scene of a major disaster on July 17th 1944, when an explosion on a munitions ship killed 320 people, mostly African American sailors. The national memorial commemorating this event became the 392nd unit of the National Park Service in November 2009. 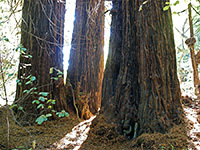 California's best groves of giant redwood trees are found in the far north of the state, protected by a narrow preserve stretching 50 miles alongside the Pacific Ocean, made up of one national park and three state parks, all administered as one entity. Besides the forested slopes, the parks contain narrow canyons, rivers, sandy beaches, coastal bluffs, sand dunes and tidepools. 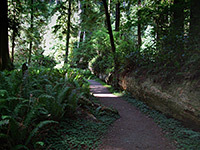 US 101 runs through the forest, giving access to many trails and viewpoints. This recently created historical park protects various buildings and historic sites in Richmond (18 miles north of San Francisco) - a city of special importance during World War II on account of the large number of war-related industries that were based here. 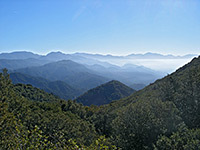 Long established as a popular recreation area, the San Gabriel Mountains north of Los Angeles received additional protection as a national monument in October 2014. The peaks form a natural border between the coastal basin and the Mojave Desert, rising up to 10,068 feet at Mount San Antonio. Activities include hiking, camping, fishing, canyoneering and fishing. Several winding, scenic roads cross the hills, and the place is often quite busy. A section of the Fishermans Wharf waterfront with historic ships, a museum, pier and visitor center are the principal components of San Francisco Maritime National Historical Park, located at the north end of Hyde Street. One of three new California national monuments created February 2016, Sand To Snow adjoins Joshua Tree National Park to the east and the San Bernardino National Forest to the west, and it spans a wide range of elevation, from low desert plains and the riparian ravines of Big Morongo Canyon Preserve, to the 11,500 foot summit of San Gorgonio Mountain. Access is from side routes off the one main road through the preserve, Hwy 62, or from Hwy 38 across the higher elevations. Like Golden Gate NRA near San Francisco, Santa Monica Mountains NRA is an urban park, containing a variety of natural landscapes and recreational facilities northwest of Los Angeles. The two main sections are the mountain range itself - a series of steep, grassy hills extending for 30 miles between Oxnard and Hollywood - and a stretch of the Pacific Ocean coast to the south. 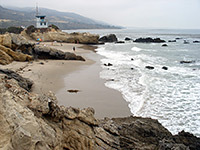 There are several state parks, state beaches and historical sites within the recreation area, which is very popular for camping, hiking, cycling and wildlife viewing. Established in 2000, this national monument contains BLM and forest service lands west of Palm Springs - two mountain ranges extending for nearly 100 miles, bordered by flat desert on one side and a grassy valley on the other. 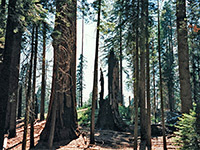 Most visitors to Sequoia National Park come to see the magnificent groves of giant sequoia trees, found scattered along the moist, west-facing slopes of the Sierra Nevada mountains, between 5,000 and 7,000 feet. But the majority of the national park contains high elevation land above the treeline, with canyons, lakes, waterfalls and granite peaks, including Mount Whitney, the highest summit in the contiguous United States. Smith River NRA protects forested landscapes in northwest California - densely wooded hills around the Smith River and its tributaries, close to the Siskiyou Mountains. Rafting, fishing, hiking, hunting and camping are the main activities. The hills and forests surrounding Whiskeytown Lake in north California are quite scenic, and crossed by many trails, though the majority of recreation takes place on or beside the water, in particular swimming, kayaking, rowing and scuba diving. 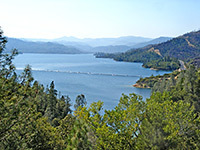 The lake is administered by the NPS, and is the most visited part of the Whiskeytown-Shasta-Trinity National Recreation Area which includes two other preserves managed by the USFS - the Shasta Unit north of Redding, and the Trinity Unit to the northwest. Yosemite National Park covers a huge area of the western Sierra Nevada mountains in central California and has innumerable lakes, meadows, forests and granite summits with endless unspoilt Alpine scenery. At the center is Yosemite Valley, a half-mile deep depression carved by glaciers during the last ice age, which now has soaring 3,000 foot high domes and many powerful waterfalls, including three of the world's highest. The most visited high elevation area is around Tuolumne Meadows, starting point for many backcountry trails.